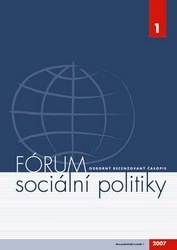 ﻿ Journal SOCIAL POLICY FORUM – VÚPSV, v. v. i. Editor-in-chief: Mgr. Hana Roztočilová, e-mail: hana.roztocilova@vupsv.cz, tel. : +420 211 152 723. Typical content: the broadest possible range of social issues, i.e. social policy, social services, state social support system, material need system, assessment service, disability, family, socio-legal protection of children, equal opportunities, insurance systems, pension insurance, sickness insurance, accident insurance, income policy, employment, employment policy, employment services, labour market, employment of foreign nationals, work of the labour offices, wage policy, wage and pay systems, occupational safety and the work environment, migration, integration of foreign nationals, international cooperation in social security, social dialogue and collective bargaining, working conditions, work organisation, legislation on all these areas in particular labour law, and other related subjects. Structure: The journal is divided into two parts of roughly the same size. The sections are itemized by the form, their scope is flexible. The first part is the Reviewed essays and Studies section, containing solely papers that the editorial board approves for publication after review. Authors may offer papers for both parts of the journal, i.e. reviewed and non-reviewed, specifying which part they are intended for. Papers offered for the reviewed part will be assessed by the editorial board, which then decides whether reviews should be conducted; on the basis of these reviews it decides whether or not to include the paper in this section of the journal. If a paper is not accepted for the reviewed section of the journal it may propose printing it in abridged form in the non-reviewed part. The editorial board will only accept previously unpublished papers submitted in electronic form. The author should attach a full contact address, including telephone number and e-mail address. Formal requirements: The manuscript of an article for the peer-reviewed section (ideally structured as follows: abstract, introduction, current state of knowledge and references to expert literature, the issue under scrutiny and methods used, results, discussion, conclusion), with roughly 20,000 characters including spaces, must contain, as well as the text proper, an approx. 20-line abstract, keywords in Czech, and a JEL classification code. Citations and bibliographic references must be complete and conform to the relevant standard. Charts and illustrations must be suited for black-and-white presentation (in Excel group column format, not spatial). Their source files must be attached as well. The editorial office proofreads the text and makes necessary linguistic alterations. Please send papers to this e-mail address: hana.roztocilova@vupsv.cz.